WAFFLES: Hello? Mister Furball with a tail thingy? Um... are you my father??? WAFFLES: Mister Furball doesn't talk much. Maybe he speaks Spanish. Oh, wait. I don't speak Spanish either. WAFFLES: Oh my cod! We have so much in common, Mister Furball! You MUST be my father! WAFFLES: Uh, oh. Wait a minute. Are YOU my father??? 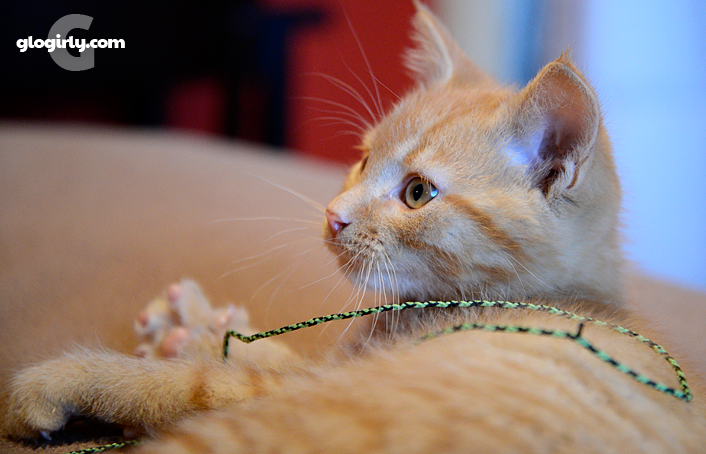 These Baby Waff photos were taken way back in November of 2012 on the very weekend that Waffles came home to live with us here in the Townhouse. In fact the first three photos were some of the very first pictures Glogirly took of him. For the first week or so, Waffles was quarantined in the Red Room, a.k.a the Kitten Room. 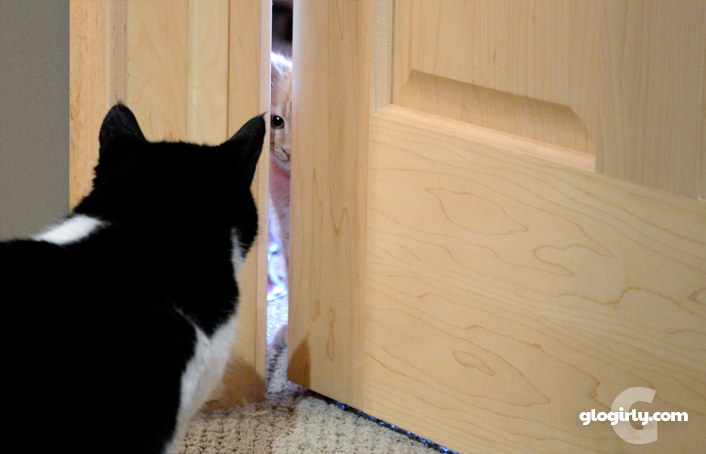 Katie had NO IDEA the craziness that lurked behind that closed door. That is until the door cracked open. We remember when Waffkes came to live with Katie and things haven't been the same since. OMC! Baby Waff is adorable! I wonder what was going through Katie's mind when she saw him the first time. He was such a little cutie. He's still a cutie but there's nothing like a kitten. Oh, Waffles, what a cutie you were! You still are, of course, but who can resist a kitten? We can't believe it's been that long! What a handsome mancat you've grown to be, Waffles. What a cute little kitten you were Waffles. Oh my cod Waffles I'm going to eat you up!!!! Cuteness overload! I want more pics of Katie and Waffles as kittens. Too cute! You still are but now you are big cute and you were once little cute. Just so cute cute cute is all I can say. Oh and plus, I wish I would have been there when that door opened. OMC, these baby photos are drop-dead adorable!! The boy is grown up, but he still has that same confused look. SQUEEEEE!!!! Wow, you've grown sooooo much!!!!! 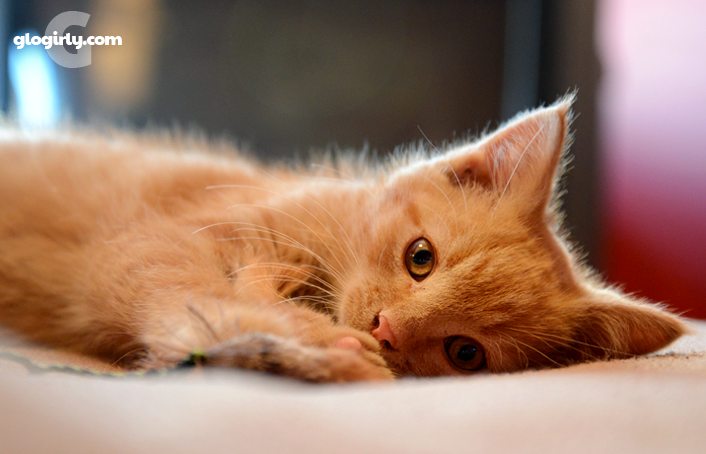 Such cute kitten photos of Waffles. It's hard to believe he was ever so tiny! OMC talk about cute overload! We had forgotten those early days. How far you have all traveled since then. Waffles was the most beautiful kitten. Sigh, they grow up so fast. oh my, where has the time gone? Baby Waff is so cute! He has grown up into a very handsome boy. 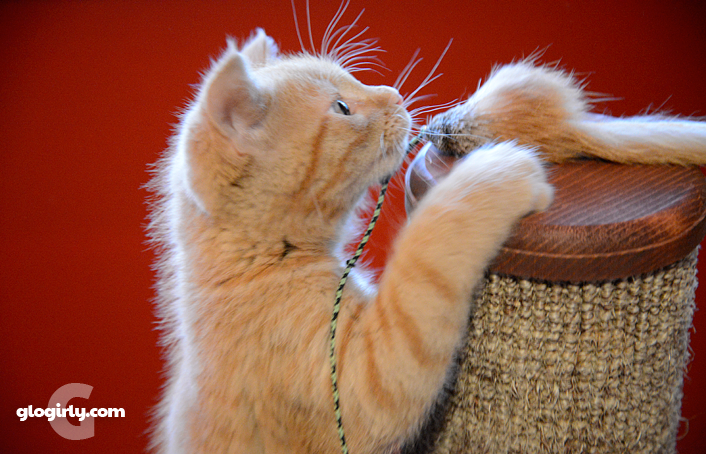 We do not think we have EVER seen a cuter kitten picture than that first one! Small cute, big handsome, always Big Trouble. ;D Katie, how you've managed to keep this one under control for two years, I have no idea. You deserve an award and a long vacation from Orange Mischief. Oh Katie, had you but known.... gotta admit though, very little is cuter than an orange ball of fluff. Waffles was such a cute kitten :) And still adorable. Waffles was such a cute kitten! And has grown to be so handsome. OMC you was so tiny and cute. You got the mom bean all squeey Waffles. What a cutie patootie! Squee! Baby Waff, just too cute!